36 ° 6’ N, 4 ° 44’ W. This is where I was when I finished my second novel, The Copper Road. I always like to know where I am. My first degree was in geography so perhaps that’s why. I finished the book on August 28th. For me, the when is not quite so important, although I do like a good milestone. To save you finding a globe or a world map (what do you mean you weren’t going to?) this is just east of Gibraltar. If you don’t know where that is, then there’s no hope for you – geographically speaking. The reason I can be so precise is that channel 17 on our cruise-ship told me exactly where we were whenever I wanted to know, which was to say most of the time. I became a little obsessed with it. As soon as we returned from the bar, or the pool, or the bar, or the mini-golf, or the bar, I’d switch on the TV to see the digital slug trail that told me where the ship had been and where we were now. Somehow knowing that made me feel a notch safer. I’ve no idea why. It’s probably related to why I loathe outsourcing my whereabouts to car satnavs – I become untethered and I begin to panic. I’m all at sea. Having an inside cabin didn’t help: no view – no point of reference. He was right. The hotel stood high on a bluff and the south facing room kept the sun all day. 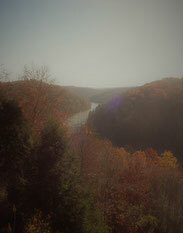 Below my window was nothing but the Cumberland River snaking away between picture-book hills painted with a fall forest. This was a great place. I had my A3 pad and coloured pens, I had my solitude; inspiration was bound to strike. I set to work. My main thought in the first few hours was how nice it would be if my wife was here to share this beautiful solitude with me. Later, panic struck when I went down to join humanity in the restaurant only to find humanity had left at eight when it closed. Worse still I was told there was no bar and this was a dry county. I had to drive seventeen miles through the, now-very-dark, forest to get a pizza from a gas station. Ultimately the solitude did pay off. Over the next couple of days there was little to do except walk in the woods and think and plot, though occasionally I was knocked out of my muse by the bear warnings. The room was safer. Strange, now, to think what I began there I would end in the middle of the Mediterranean. The real Copper Road existed (a very small section of it still does) in Polk County, in the bottom right-hand corner of Tennessee. Of course I haven’t really finished the new book, just the first draft. Whirligig took around eight drafts, but it’s certainly a milestone. I remember Jason Goodwin, author of the wonderful Yasmin mysteries, telling me that finishing the first draft of a novel was like finishing a bridge. You could step back, take a look at what the hell it was you had built and make plans to put it right. I’m not sure that analogy really holds up; I’d like my bridge engineers to know what they are doing from day one. Maybe a book is more like a painting. You can step back and decide on some changes. Perhaps some of the people in the picture are not needed. Others may need more character. If you’re me, you may have overdone the background and have to lose some of it in subsequent drafts. And in writing terms, ‘stepping back’ generally means ‘putting down’. Getting away from your story so that when you come back to it you can see it afresh. So that will be September for me. No Copper Road allowed no matter how much I want to crack and eye and peek. For now, I’m content to know where it started and where it ended: in a room with a view, and in a cabin without one. I can't wait to read this book! If it's anything like Whirligig it's going to be an incredible read! Congrats on reaching this milestone Richard. Best of luck for all the edits!